Remove sinews from veal tenderloin, then vacuum seal. Cook in steam oven set to sous vide function at 57°C/135°F for approx. 1.5 hrs. In the meantime, clean and cut mushrooms into thin slices for the mushroom sauce. Cut onion into small cubes. Finely dice garlic. In a sauté pan, heat up some vegetable oil over medium-high heat. Sauté onion for approx. 2 min., until translucent. Add mushrooms and fry for approx. 3 – 5 min. Deglaze with white wine and veal stock. Add halve of the chopped garlic and stir. Simmer at medium heat for approx. 10 – 15 min. until reduced by half. Add cream and bring to a quick boil. Season with picked thyme leaves, salt, and pepper. Bind sauce by stirring in cold butter. Let simmer for a few minutes to thicken. Remove tenderloin from vacuum bag after cooking and pat dry with paper towel. Season with salt and pepper. In a frying pan, heat up some vegetable oil over medium heat. Fry veal tenderloin on all sides until browned. Add rosemary and remaining garlic and fry with the meat. Remove tenderloin from frying pan, cover and let rest for 3 – 4 min. Season with fleur de sel to taste and cut into slices. 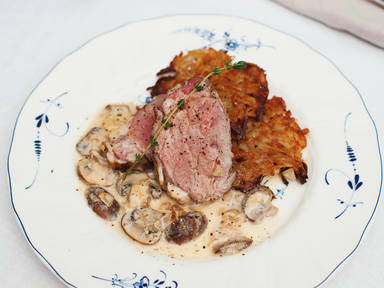 Serve with mushroom sauce and potato rösti. Enjoy!